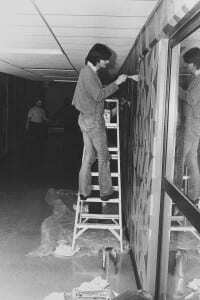 Completed in 1973 to connect the Library-Learning Center with the new Student Services Building, the gray concrete tunnel’s first paint job consisted of colorful geometric shapes that looked a lot like… well, macaroni. Psychology Profs. William Smith, Per Johnson and Design Profs. 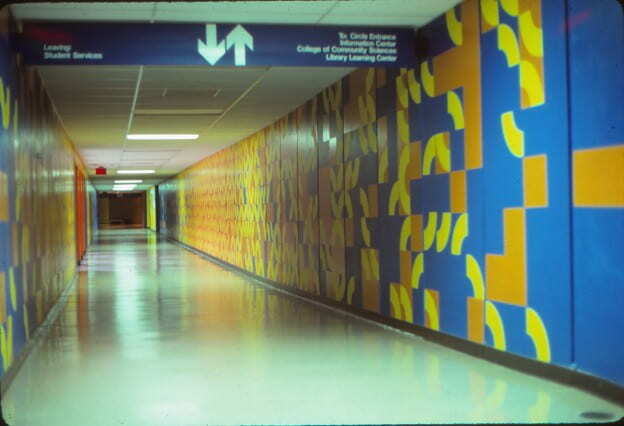 Ronald Baba and David Damkoehler worked with students on the repeating pattern meant to make the corridor more appealing by visually separating it in two. Legend has it there was only one full “O” in the entire 30-yard array. Any results of the experiment were lost to history, as was the paint job, covered over by the mid-1980s. This entry was posted in Phoenix Phactoid and tagged facts, interior design, trivia on August 25, 2015 by Christopher Sampson. It happened suddenly, without much warning. 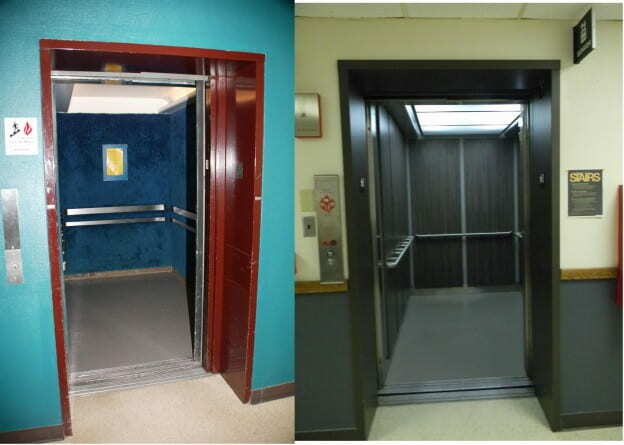 A victim of progress and elevator-car update, the famous blue-shag carpeting on the walls of the Theatre Hall (née CC) elevator was ripped from the scene in 2013. In its heyday, students couldn’t resist the impulse to leave a handprint as the ride from floor 1 to floor 3 was normally so slow, it helped pass the time. The Cofrin Library archived a small remnant of Ol’ Blue as a memorial. A small patch of blue shag carpeting (once ubiquitous in the mod, 1970s-era areas of campus), still exists as a wall covering opposite the elevators on the library’s seventh floor… fittingly, just outside the Archives and Area Research Center. This entry was posted in Phoenix Phactoid and tagged facts, interior design, shag, trivia on August 21, 2015 by Christopher Sampson.